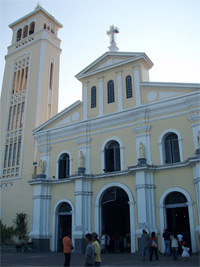 Manaoag, Pangasinan is one of the Philippines’ pilgrimage centers, thanks to the presence of the Our Lady of Manaoag Shrine, home to the image of the Nuestra Señora del Rosario (i.e., Our Lady of the Rosary), which is believed to have miraculous powers. Non-Catholics may scoff at such idolatrous devotion, but that has not deterred millions of Filipino Catholics from visiting the shrine and venerating this representation of the Virgin Mary. The image of Mary itself is said to have been brought to the Philippine Islands by way of Acapulco, Mexico by Padre Juan de San Jacinto around 400 years ago. Folk history even declares that it was the Virgin herself that designated where the church to house her image was to be built. Nowadays, pilgrims visit the church all year round but it is especially busy during the summer months of April and May. Many leave their homes before daybreak just to reach the morning masses in the shrine and to be the first in line to touch the image’s robes through a small hole at the back of the altar. According to a 2001 article from the Manila Bulletin (mirrored here), the numbers of pilgrims lining up to touch ivory image often climb into the hundreds—the turnover time taking hours—and can reach to the streets outside the church, which if you look at in Google Maps is quite a stretch indeed! The shrine’s official website is a bit disorganized but may be helpful (depending on what you’re looking for) and you can see a picture album of the church from my blogger friend Markku should you be interested to see more. Well done! Keep the KML coming. but with the waypoints available via a shareable web spreadsheet like EditGrid, updating (& adding) to the KML would be amazingly simple. Give me a shout if you’d like to collab on this. @Dave, thanks! Yeah, I’ve seen the Spreadsheet-XML-XSL-KML conversion. I just don’t see any use for it right now in relation to Vista Pinas. I generally stick to placing my geodata in some sort of database instead of a collaborative spreadsheet. But, I might revisit this in the future. Want an extra-ordinary room in Manaoag? Try STAR OF DAVID HOTEL (tel:5192871. For the first time after 30 years that I wasn’t in this hometown of Manaoag I loved, I was so happy to see the development of the town of Manaoag! And lo, there are now hotels! I stayed in the newest hotel – the STAR OF DAVID HOTEL and i was so satisfied from their service! They have very clean and extra-ordinar decorated rooms I’ve never seen in any hotel…. a great new experience and idea! Check this hotel — at starofdavidhotel.googlepages.com or contact them at this phone: (75)5192871… Hi to all pilgrims and to all people in Manaoag. How much po if 2 persons?thanks.